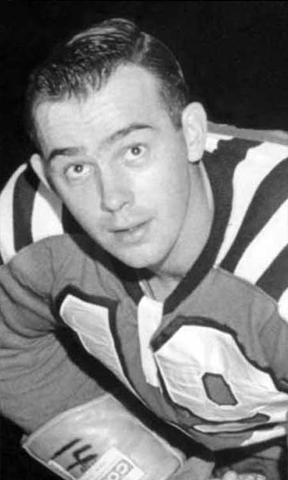 Parker MacDonald began his career in the Toronto Maple Leafs' chain, and played his first game during the 1952-53 season. After finally getting to play full-time in 1954-55, New York plucked MacDonald from the Leafs' roster in the Intra-League Draft, but his fate was to continue to be shuffled between the Rangers and their AHL affiliates for four seasons. One of those affiliates was the Reds. Parker suited up in only 2 games in 1956-57, exploding for 4 goals and a single assist. When New York gave up on MacDonald after 3 seasons he sought out a doctor to examine his chronically sore shoulder and was astonished to find out that a chunk of metal was still embedded in it, the result of a broken drill left in him from a previous operation. Detroit grabbed MacDonald in the Intra-League Draft in 1960 and made him a regular. Feeling much stronger, MacDonald showed the kind of offensive prowess his career had promised and displayed only occasionally like it did with the Reds. He finally delivered on it playing on a line with Gordie Howe and Alex Delvecchio. Those line mates could do that for a player! In 1962-63, MacDonald scored 33 goals, eight of which were game winners. After five seasons with the Wings, he was traded to Boston, lasted just half a season, and was traded back to Detroit. During the 1967 Expansion Draft, MacDonald was chosen by the Minnesota North Stars. After two seasons in the Twin Cities, he retired to pursue a coaching career. MacDonald returned to Minnesota in 1973-74, this time to coach the North Stars. He lasted one season, and later coached the Los Angeles Kings in 1980-81. Parker was elected to the Cape Breton Sports Hall of Fame in 1987.